Too Cold to Fish? Never! With the pike season well underway, how can you make this season one to remember? Dom Garnett, whose new book 'Tangles with Pike is out now, provides a few thoughts to break old habits and bank more fish. Dirk Fastenau of the Quantum Specialist Team gets the Joker out of the pack on a lure fishing session. With over half a century of observations on running and still water, Bob James has a keen eye and some fascinating thoughts on pike. 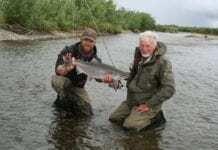 Dom Garnett met up with him on the River Test. This month Paul Garner is dabbling in a bit of River Wye barbel fishing but it's the time of year when his mind turns increasingly to predators on the big ressies. Paul Garner recounts the back end session that brought him one of the biggest zeds of all time!